Hong Kong, Miami, Palo Alto. Just name a city where Apple is a household name and Appleheads were out in force Friday, all waiting to buy the latest iPhones, the 5c and the 5s. In Palo Alto, Apple CEO Tim Cook made a surprise visit to the Apple store just minutes before the doors opened at 8 a.m.
"Wow," Cook said, reacting to the lines wrapped around the block. "I love it." 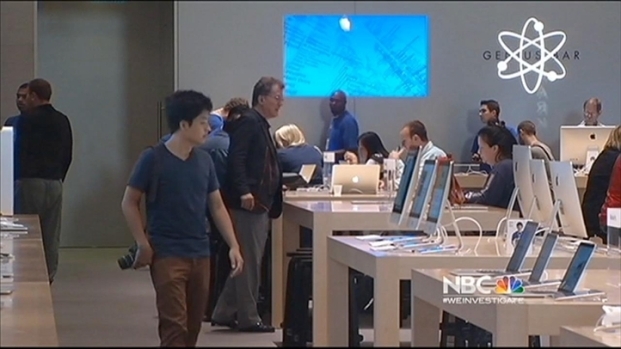 Many stood in line, some for days, at Apple stores in anticipation for the new iPhone 5S and iPhone 5C. Scott Budman reports. He looked jubilant, shaking hands with customers who numbered more than 150 snaking around the block. He hugged employees and signed autographs. Employees said they had no idea the head of the company was going to be showing up at their store, which in the early morning hours, had looked like a homeless encampment with people sleeping on sidewalks and slumping in camp chairs. 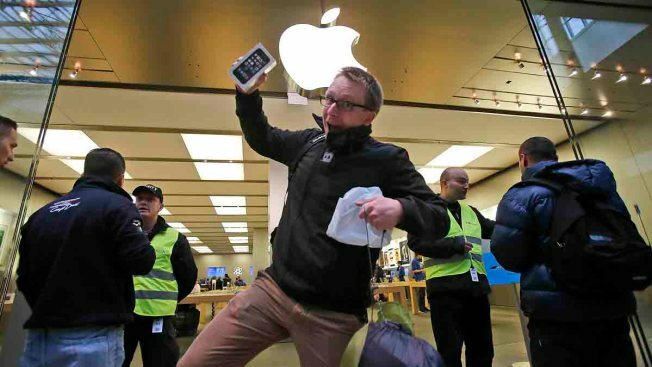 A group of about 30 people gathered Thursday night in anticipation for the new iPhones released on Friday. George Kiriyama reports. But Apple headquarters are close by in neighboring Cupertino, and visiting the stores was something the late Apple co-founder Steve Jobs often did. The crowds were eager to buy the new iPhone 5c and s, which features a new fingerprint scanner, an upgraded camera with slow-motion video capabilities and a faster processor. 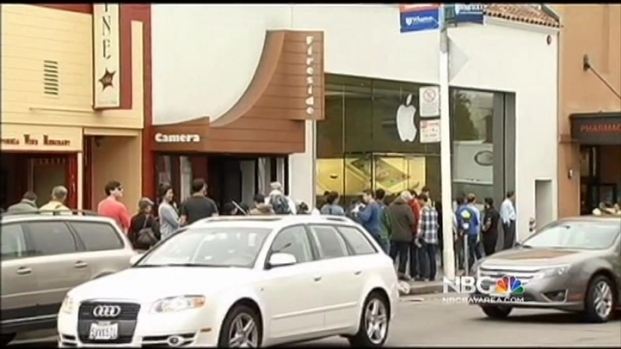 One person had even been waiting in line outside the Palo Alto store since Monday. "I just come out here. I love being part of this crowd. I love waiting in line," Fitzgerald Geonzon told NBC Bay Area. "It gets boring sometimes, but 10 minutes before the launch, you get a feeling of sensation." The line at the Palo Alto store was not as long as previous lines like last year's iPhone 5 release, but old habits are hard to break for many Apple faithful. "It's fun to stay out here all night," Matthew Hall said. "When else do you get an opportunity to camp out in downtown Palo Alto? So that's fun. Plus my current one is breaking." One loyal Apple customer - and a former co-founder - was not in line. Steve Wozniak, who is usually at every Apple event, tweeted out that he and his wife were tired on Thursday night to stand in line at their favorite store in Los Gatos. 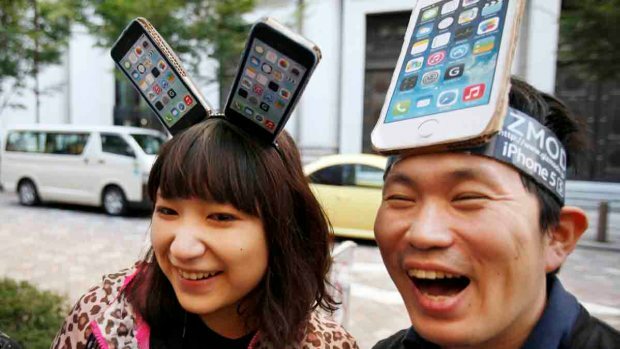 Across the globe in Hong Kong, customers were already getting their hands on the new phones. The same was true along the East Coast, and pretty much everywhere else where they sell the product. In Miami, for example, crowds began lining up early, too. Everyone was excited to see the new host of colors. The iPhone 5c comes in blue, green, pink, yellow and white – and will be available for a retail price of $99 for the 16 GB model and $199 for the 32 GB model. 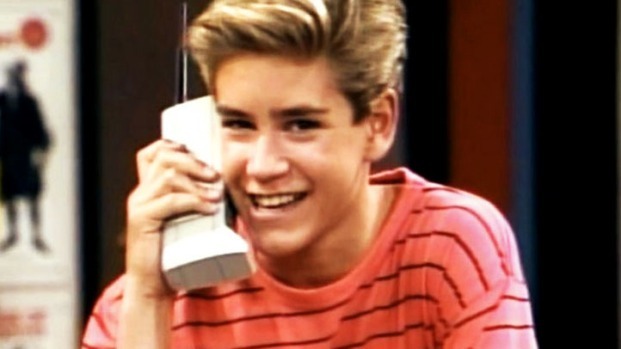 The all-new iPhone 5s, Apple's latest update to its line of popular smartphones, comes in gold, silver or space gray, retailing for about $199 for the 16 GB model, $299 for the 32 GB model and $399 for the 64 GB model. Apple cases for the phone will be available in beige, black, blue, brown, yellow and red for $39 through Apple online store. All of the new smartphones feature Apple's latest mobile operating system, iOS 7, which is the company's most significant revamp since it launched the original iPhone.